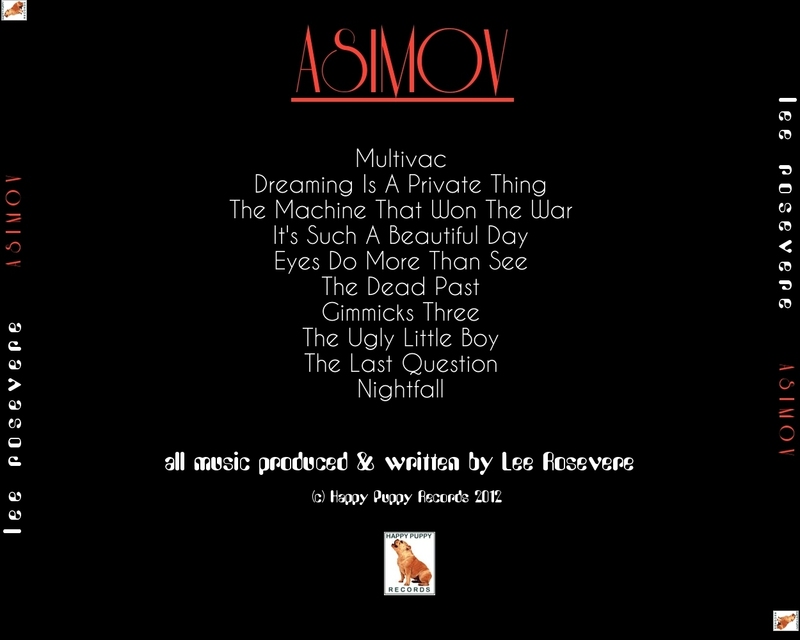 An album of original music, inspired by the writings of Isaac Asimov. Each track is named after the corresponding short-story that inspired it. I realized after completing this album, that it would be more beneficial to the listener if they were familiar with the stories the songs are titled after. Instead of posting the stories here (and risking some serious copyright infringement), I've written some notes as to my impressions of the stories and how the music was created around those. Although, for the best experience I would strongly urge you to seek out the stories you're not familiar with. these compositions. So, it is fitting as it serves a bit of a 'overture', combining little pieces of sounds stretched over the infinity of time. A company that sells high-quality 'dreams' for those that cannot dream, is threatened by competitors who cheapen the experience for mass consumption. There are so many interesting elements in this story that can applied to our current world in so many ways... least of all the dangers of selling the act of private creation: our world where originality is not valued as much as copying or repeating what's been done before (not a matter of using the past to create something new, but simply re-creating it with cruder methods and no context), combining that with the commodification of something that so personal is terrifying. Are we that uncapable of doing anything for ourselves? The drums and bass guitar play the 'predictable' parts (the Luster-think) while the "Dreams Inc" tries to fly above it. Sometimes society gets wrapped up in their own routine, failing to notice the sheer beauty that surrounds them on a daily basis, until a moment of chance changes everything. Matter does matter - probably one of Asimov's strangest stories (personally speaking), even with it's emotional ending. One of my favourite stories from his collection - not so far from the real world, as a home-made 'chronoscope' (a device that allows viewing of any place or time from up to 80 years ago) makes security and privacy a thing of the past. A fun little story about a man who tricks a demon into keeping demonic powers and remains undamned. The music doesn't reflect the narrative directly, just some of the more disturbing demonic variety. Two opposing melodic lines represent the story of the Nurse who looks after the "ugly little boy" from a prehistoric time, and the scientists who brought him (through time-travel) into our world and regard him as simply an experiment. Eventually, the two meet through force and the unknown takes over. A brief story about the end of mankind, and the dawn of New Age of the Multivac. Or was the Multivac the creator all along? 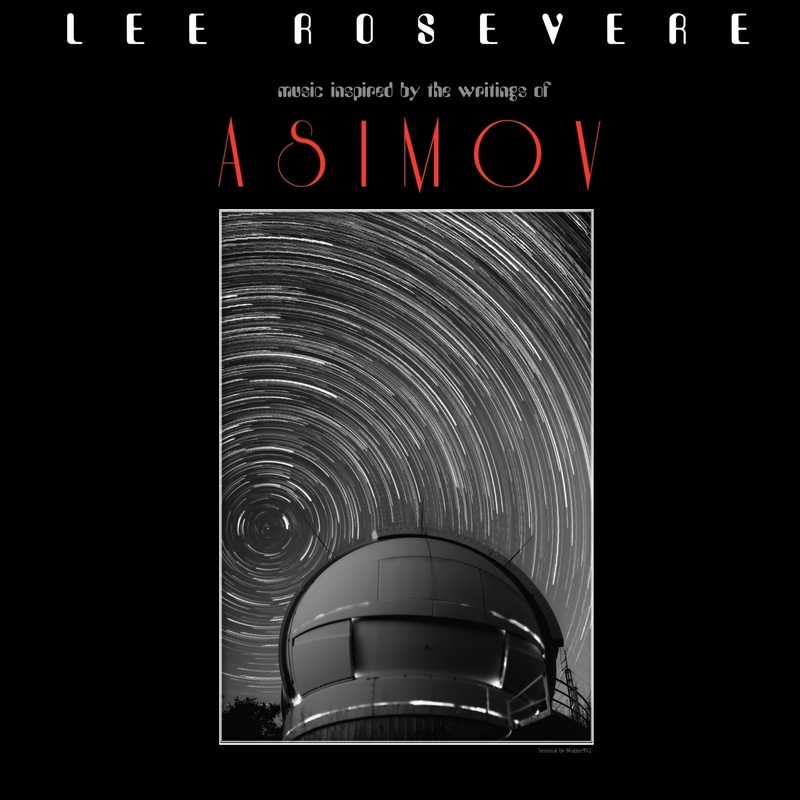 One of Asimov's most famous stories, the music attempts to re-create the world that knows nothing but daylight. Unsettling, but bright sounds hint at the looming darkness that must come, ending with the crescending voices of fear and madness. Interestingly, this piece was first constructed in the exact opposite manner that it is presented here... feel free to play it backward for a more happy ending. 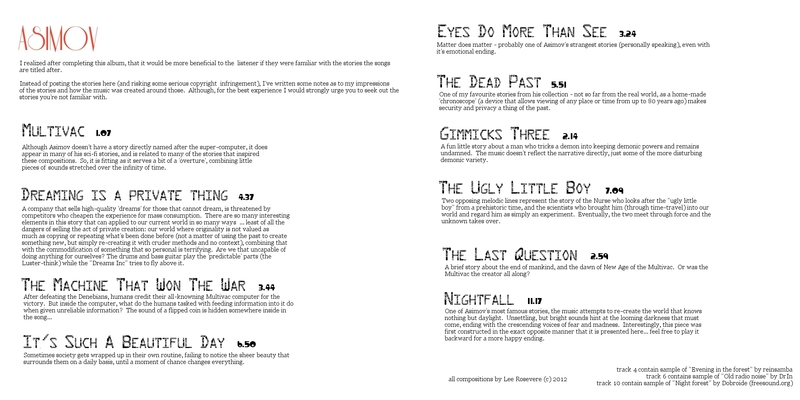 The Ugly Little Boy by Lee Rosevere is licensed under a Attribution-NonCommercial-ShareAlike 3.0 International License.